Left: the church in 1823. Within the Caribbean region, few wooden cities on the small islands will match the amount and diversity of building stock present in Georgetown. The city has a unique plan based upon 18th-century Dutch plantation structures only to be found in the West, supplemented by predominantly wooden 19th-century architecture. The authenticity of Georgetown as an ensemble stems from the remarkable combination of architectural styles, which are mostly European in origin, such as Gothic, semi-Tudor, Romanesque or Italian Renaissance, but have all been executed in wood. Within the English Colonial Empire this unique aspect is virtually unmatched. For 186 years St. Andrew's Kirk, with its high steeple and quaint double-angled roof, has graced the landscape of the city. In the words of Reverend Archibald Browne, one of its early ministers, this church was built "with a view to afford the Scottish part of the community an opportunity of having the Ordinances of Religion administered to them according to the form of the Church of Scotland." It was here on August 1, 1838 that the Governor of British Guiana, Sir Henry Light, attended an afternoon service to observe Freedom Day, which resulted in the emancipation of the enslaved Africans, many of whom crowded the upper gallery and surroundings of this ecclesiastical structure, despite the inclement weather, to witness this historic event. According to a report, this structure was probably constructed on the site of the old Indian Post, which was one of the marks of European civilisation during the earliest phase of the development of Demerara in the 18th century. As trade increased and Demerara attracted a considerable number of planters, the trading post was replaced by a Brandwagt (fire watch), or signal station, around which a little village, Stabroek, was established. Although Demerara blossomed into a thriving colony, there existed no Predikant or Kerk (a reverend or head of the church). Twice a year the Predikant of Fort Island, the seat of the Dutch administration for the colony of Essequibo and Demerara, visited the younger colony (Demerara). Here he established his headquarters at Borsselen Island, one of three small islands up the Demerara River. Without a fixed place of worship, marriages, baptisms and other ceremonies were conducted at the houses of several planters such as Donald Stewart of Dunoon, on the left bank of the river. Many of the early settlers were dissatisfied and complained bitterly to the Council of Ten in Holland. In 1776, after repeated requests, a Predikant, Hermanus Linguis, was sent to Demerara. Although the Kerk was formed, there existed no structure to allow for worship by parishioners. The colonists again approached the Council of Ten in Holland who passed a resolution in 1784 that a 'church should be erected in Demerara for the extension of religion'. This promise took several years before it was fulfilled, as Borsselen Island was soon abandoned as a result of the colonial rivalries between the British and the French. Their actions disrupted the original ideas of the Dutch to relocate the seat of government from this small island to have a new town between Pearl and Coverden. In the circumstances the Dutch adopted the actions of the French and established Stabroek as the capital of Essequibo and Demerara in 1784. Divine services were conducted in a small room underneath the Court of Policy Hall. Henry Bolingbroke in A Voyage to Demerary, first published in 1807, offers an interesting description of the service. He noted that "the Dutch service is first performed on a Sunday, by an ecclesiastic of that country, after which the garrison chaplain reads the prayers appointed by the Church of England." An old Dutch leather-bound Bible, with brass studs with the inscription Kerk Van Demerary Ao 1788, was one of several items transferred from the Dutch church at Fort Island to Demerary when the seat of government was relocated. Sadly, this artefact was destroyed when the library of the Royal Agricultural and Commercial Society was consumed by fire in 1945. Other artefacts of the original church in Essequibo were handed over by Mr. Obermuller, one of the last surviving members of the original Consistory, to Reverend Slater in 1871. These items included a sacramental plate, 'a flagon, two mugs, a large plate, two small plates and a baptismal basin with the cover inscribed 'De Kerck in Rio Essequebo, Ao 1772.' In addition, another flagon, two plates and a baptismal basin with the inscription De Hervormde Kerk in Rio Demerary, 1792 were also handed over. According to a report, both sets of plates were granted to the Dutch Reformed Kerk by the Dutch West India Company. In 1810 the English colonists erected St. George's Chapel. Their actions propelled the Dutch to take affirmative action. On June 26, 1810 an article by a correspondent, Laicus Brittaniicus, in the Essequibo and Demerary Gazette recommended that the Dutch should erect "a decent and respectable Place of Worship for themselves." On May 1, 1810 the Court of Policy, the body responsible for the administration of the colony, was presented with a petition. The members indicated that they "were in want of a regular place of worship, which would encourage a love for divine worship." They also requested financial assistance, similar to that which has been granted to church members in Suriname. After careful consideration the sum of 15,000 guilders was granted "to assist in defraying the expenses of so useful and praiseworthy an undertaking." On October 31, 1810 Governor H.W. Bentinck granted the Dutchmen a plot of government land, which was situated to the "west of a guard house and separated by a public road" for the purpose of building a Dutch church. A large public cistern occupied the area, which was not in use. On August 12, 1811, about mid-day, a little procession - including Governor Bentinck, a number of the officers of the Demerary Militia and the Predikant, Reverend Gabriel Ryk, walked from the King's House on the Brickdam, Stabroek to a vacant plot of swampy grass near the Demerara River. Here the procession halted, and after an eloquent and impressive oration by the Predikant, the Governor held the level while there was lowered upon a lead plate resting on a brick foundation the sill of a building intended for a Dutch Reformed Kerk. The Governor in his brief speech stated that "the fabric itself, if we may judge from the plan we have seen will be equally as ornamental to the town as honourable to the architect." In 1891, when the church was restored, this sill was uncovered and is now stored away. The Dutch commenced their task with vigour, securing well-burnt bricks and mature and seasoned greenheart for the construction of their church. Though incomplete, services were conducted in 1812. By 1813, the construction of the church was being hampered by financial constraints. In January, Issac Hadfield, an architect, petitioned the Court of Policy. He stated that he had been contracted to complete the joinery work of the building, but was constrained by the lack of finance and building materials. He further claimed that he was owed a great sum of money, more than 15,000 guilders. He stated that he had paid a great deal of money in wages to workers he owed and consequently did not have the required funds to purchase the building materials and as such was unable to complete the task. Hadfield proposed that the Court intervene, as the church could without any alterations be converted to a Court House and the offices of the Public Buildings. "Georgetown," he stated "has of late undergone so many embellishments, by which it has become highly respectable in the list of our Western Settlements, and as in all Towns the Court House is or should be an edifice of first rank, your petitioner respectfully recommends to the Honourable Court the purchase of this unfinished Building for the purpose." The body of the building, being 70 feet by 50, two stories high, the upper one would form a spacious airy and elegant court, being in the centre about 22 feet high, and 26 feet wide with a gallery of 12 feet on either side. The leeward gallery might either be formed into apartments for the Secretaries and Public Archives, or added to the area of the Court. The lower galleries being together 40 feet by 12 would be sufficient for the Secretary and Marshall's office and any other area that ought to be contiguous to the Court, leaving the area below unoccupied except as a walk or exchange. The site and external appearance of the building are very appropriate for this purpose. According to one report, the Court had considered the acquisition of this structure, as their offices were housed in a 'tottering building' supported by poles. A Marshal's notice in the Essequibo and Demerara Gazette of 10 April 1815 advertised for sale 'all and every part of the building called the Dutch Church the same at present unfinished, situated in Stabroek Georgetown.' Several members of the Dutch Vestry purchased the building on 4 May 1815. Reports indicated that the structure remained unused and exposed to weathering. In fact, the Inspector General even remarked that 'it will soon be rotten as the rain beats in on all parts'. In 1815 the Dutchmen who purchased the structure approached the resident Scottish population who were desirous of establishing a church in Essequibo and Demerara. They offered the Scots an opportunity to invest in the church by surrendering one half of their shares to allow for the completion of the structure. This proposal aroused the desires of the Scots to consider the proposal, as they had no place to worship, while the English, the Dutch, the Wesleyans and the London Missionary Society had already established churches in Demerara. On Saturday, 23 September 1815 a large number of resident Scotsmen gathered at a special meeting at Marshal's Hotel. Chaired by Mr. Lachlan Cuming, the group discussed the possibility of erecting a church 'to have divine service performed in the colony according to the rules of the established Church of Scotland, under the charge of a respectable Clergyman of that persuasion'. The committee, chaired by Lachlan Cuming, and including Donalds Campbell, Robert Selkrig and George Buchanan among others, contacted Joseph Hadfield. They requested that he provide them with estimates to complete the church with any alterations that might be required. The committee after a short deliberation soon accepted the proposal by the Dutch. Funding to execute the works needed was raised through public subscription. Upwards of 1,000 pounds was raised on the spot. On 6 October 1815, the total funds raised totalled 3,000. Among the numerous subscribers was the minister of St. George's, Reverend W.G. Straghan. By the start of the New Year this figure totalled approximately 4,000 pounds. The Court accepted the petition and granted the requests of the Scots. A sum of 3,800 guilders per annum was set aside to support the Minister of the Scot Church upon his arrival in the colony. F.B. Van Berkyl and Mr. Heyliger, who had purchased all of the shares in the Dutch Kerk in 1813, offered this building to the Scots by a letter to the committee that had been established. On 26 February 1816 'tenders for the finishing of the building intended for the Dutch Church,' according to the plan and specifications of Joseph Hadfield were advertised. In June 1816 the transport was passed to the new owners. After several months of extensive repairs and alterations, St. Andrew's Kirk was officially opened for public worship on 27 September 1818. Reverend Archibald Browne, a graduate of Arts from the University of Glasgow, delivered the first sermon. The report in the Essequibo and Demerara Gazette further stated that the concert was a huge success.' The programme included an overture, with organ and a full band, soprano, tenor and bass solos, and grand choruses from Handel and Hadyn, sung with full accompaniments of the organ and band.' The event was attended by over 500 people and tickets were sold at 12 and 6 guilders. Three years later, in 1825, another concert was staged. This time the production was said to have been more elaborate with a 'Battle piece for piano and full band, in which were introduced some original Indian and African airs composed by Mr. Edelmann', who was appointed as the organist in 1821. In 1828 a choir was formed. Annual Christmas concerts also punctuated the cultural calendar of activities in Demerara. During the First and Second World Wars organ recitals were held fortnightly, raising substantial sums for war relief and the Red Cross. On 13 August 1823 martial law was declared in Demerara, as the enslaved Africans revolted. Because of its proximity to the Guard House, the church was appropriated as the barracks for the Provisional Battalion of the Demerara Militia. 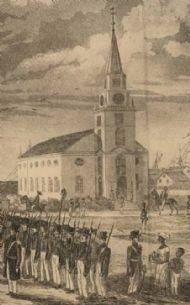 The church would remain occupied by the militia until 19 January 1824 when martial law was lifted. The history of the present St. Andrew's School can be traced to a meeting of the vestry and a session moderator on 30 March 1840 for the formation of a Parochial School in connection with the Church of Scotland in the parish of St. Andrew's. The minutes of the meeting stated that the church had to undertake a serious role in the educational enhancement of the children of the poorer classes of he parishioners. Some time after this meeting a decision was taken to erect a schoolhouse 'on that piece of land situate to the north to the St. Andrew's Church', to contain at least 200 pupils. In May 1841, the Combined Court once again rendered financial aid to St Andrew's. They granted the sum of $2000 for the erection of the school under the provision that the parish would also raise a similar amount. In November, this school was opened. St Andrew's Kirk has changed dramatically since it was constructed some 186 years ago. In 1849 a report of the North British Mail described the Kirk as 'a neat wooden building, well-fitted up inside. Unlike our Scotch churches at home it has an organ loft. The appearance of this church, however, is entirely spoiled by being placed in an unenclosed plot of land with rank grass and filthy trenches surrounding it'. In 1852, a new spire was erected, as the original was in danger of falling. In addition, the original rounded Norman windows and doors were removed and replaced by new ones, which were designed along Classic and Gothic architecture to enhance the tower of the church. The church was further enhanced in 1891 - 92 with the addition of two porches on either side of the tower. These were, however, removed in 1911 - 1912 when the church underwent a massive restoration project to celebrate their centenary anniversary. The foundation of the church was consolidated with concrete. Two new entrances were created on the northern and southern side of the church. The interior of the church was also reshaped as the organ and choir gallery, erected in 1830 at a cost of 2000 guilders, were relocated from the Chancel and placed in the southeastern portion of the building, acting as a screen for the vestry. The main reason for this was that the congregation sat with their backs to the organ and the choir. This situation was according to one report described as awkward, especially during recitals.The magnificent stained glass window, which is today in dire need of restoration by a specialist, was also erected during this period as a memorial to Patrick Fairbarn, an elder of the church. In 2003 this church was restored. In an era when many seem inclined to demolish wooden structures to replace them with concrete edifices of little architectural merit, the congregation of the St. Andrew's Kirk deserves our commendation. Hopefully its example will encourage all to conserve our uniquely built heritage. St. Andrews's endearing value to the cultural landscape of the city has been identified, as it is one of thirteen structures to be listed when Georgetown, will, hopefully, sometime in the future, be submitted to the World Heritage Centre for inscription on its prestigious list of sites of universal and outstanding value, reflecting a unique and diverse craftsmanship.